Well, we finished our homemade acoustic array and nick-named it the Potato Gun in honor of the usual instruments people make with large quantities of PVC pipe in the backyard. 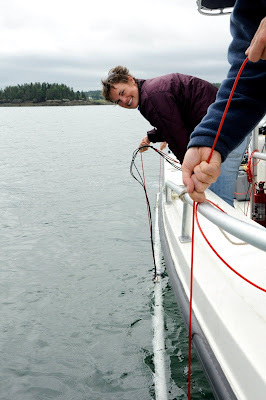 Our "Potato Gun" consisted, in the end, of about 20 feet of PVC pipe sawed in half with 3 evenly-spaced hydrophones nestled into the underside. The goal was to create an array with which, when a whale vocalizes under the water, we can triangulate in on the sound and determine where it came from. (You can find a good description from Northwestern University of earthquake triangulation here; we're using the same idea, but with waves of sound.) This allows us to determine which one of the many whales we're often surrounded by most likely made the noise. One of our nested hydrophones. Though our idea, I think, was sound (hardy-har-har), our makeshift array didn't really fly in the water. When we tested the array, dropping it just a few feet below the surface so that we could visually assess how the half-pipe was cruising, we heard a lot of strumming noise from the lines we had attached to the pipe and the weights we had to strap onto the array in order to keep it level under water. Plus, one of the hydrophones ended up sitting right next to the engine, and the engine was so loud as to likely block out any low or distant whale calls. After so much planning and brainstorming, and after using our own hands to make our vision of a perfect array into a reality, it was quite disappointing to find that it didn't work like we had hoped. But, such is science--while these trials can be frustrating, they're also what we love about our jobs. Plus, we already have an array that works well enough for the moment, so we simply continued to record using our original system during our days out on the water. Yes, the weather has been less than desirable, only allowing us 4 days on the boat in the past 22, but the days we have ventured into the bay have been phenomenal. The first whales we've found every day have been the right right whales for us: mother/calf pairs. All together, we've collected just under 20 hours of acoustic and behavioral recordings from the pairs, which is a lot of new and exciting data. We've seen multiple events where the various calves have separated from the their mothers, and we have assiduously recorded the behaviors and sounds that mark their returns. With this kind of data, we can determine the environments in which it's most important for mothers and calves to be able to communicate vocally and the behaviors that mark the calves' steps in maturation. And understanding right whales better is one of surest ways to go about protecting them better. Photographing a pile of right whales during a gorgeous day on the water. As Scott says with a wry smile, "This sure beats working!" Stay tuned for a blog coming soon where you can hear some examples of the sounds we've recorded with our hydrophones this season!